➤ Upon arrival, you will be welcomed by our representatives and then transferred to hotel for check in. ➤ After check in, you will have free time to explore on your own for the entire day. ➤ After breakfast, proceed for half day city tour and visit Wat Indrawihan (Standing Buddha) . You will have an awesome feeling to stand before this Buddha image that reaches to the sky at 32Metres tall. 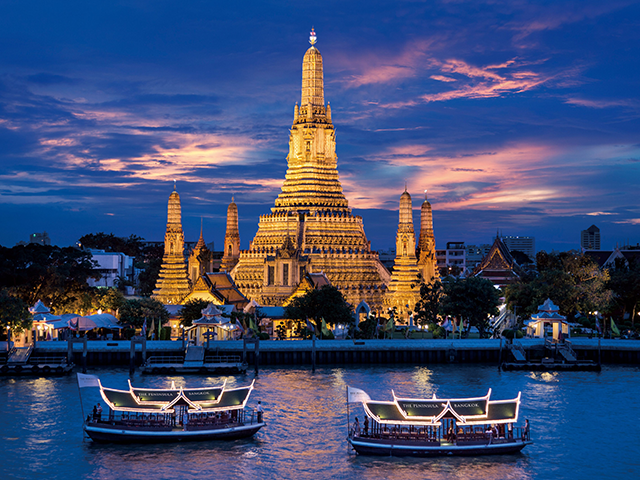 ➤ Continue the tour and take a boat to cross the Chao Phraya River and visit Wat Arun (Temple of Dawn) . This is one of Bangkok's best known landmark. It stands on the west bank of the Chao Phraya River in Thonburi. It is best seen from the opposite bank of the river where it glistens in the sunlight during the day and stands dark and noble during dawn or dusk. ➤ Continue to visit the World's Largest Jewellery & Gems Centre, Honey Bee Shop & Leather Factory. Lunch at local restaurant and continue travelling to one of Thailand's famous city - Pattaya. ➤ Enroute, visit Sriracha Tiger Zoo where there are varieties of animal's shows. Thereafter, proceed to Khao Cheechan Valley where you can see the Buddha image seated in meditation position + FREE 10 minutes Elephant Ride at Elephant Camp. ➤ Lastly, visit Thai Thani Arts & Cultural Village, here you will witness Thai Architecture, sculpture and handicrafts preserving a vivid glimpse of daily life of Thai people in the past. In the evening, a Khantoke Dinner will be served in the village with short performance (Dinner with show). ➤ Next, visit " Art In Paradise ". Here you will be amazed by the most advance 3D paintings, a work of Thai culture and fun in miniature episodic content by expressing the active participation of visitors to encourage fun interactive art museum. ➤ Overnight stay in Pattaya. ➤ Breakfast at hotel. Day trip to Coral Island (Koh-Lan) by speedboat. You may also enjoy swimming, snorkeling, water-skiing, banana boat ride (Optional at own account). ➤ In the afternoon, return back to Pattaya and lunch will be served at local restaurant. ➤ Thereafter, proceed to Moo Ban Chon Pao (Long Neck Village). Here you will enjoy Hill Tribe Culture, The Kayan Lahwi people, also known as Padaung, are an ethnic group with populations in Myanmar (Burma) and Thailand. Padaung women are well known for wearing neck rings, brass coils that are placed around the neck, appearing to lengthen it. The women wearing these coils are known as “giraffe woman” and you can join the activities inside. ➤ Dinner at local restaurant. Check in hotel and overnight in Bangkok. • 3D Bangkok + Chao Phraya River Cruise with Flight Inclusive! • 4D Best of Bangkok with Flight Inclusive! • 5D Best of Bangkok Pattaya with Flight Inclusive!